The U.S. Coast Guard has released video footage of a Cirrus SR22 ditching into the Pacific on the 25th of Jan. The SR22 was being flown by a commercial pilot on a repositioning flight from Tracy, California to Maui. It’s a long flight and well out of range for a normal Cirrus SR22. The aircraft was fitted with ferry tanks – extra fuel tanks meant for large water crossings. 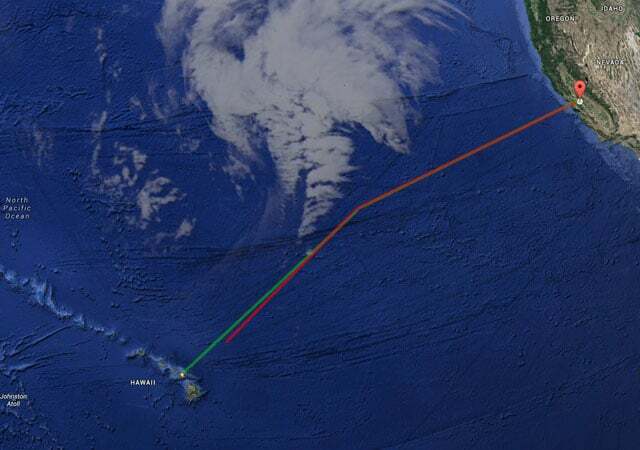 The flight was uneventful for the first 14 hours or so… until the aircraft was about 900 miles from Hawaii, when pilot realised he was unable to transfer fuel from his aft auxiliary fuel tank. The fuel transfer system had malfunctioned: although the aircraft had plenty of fuel for the remainder of the flight, the pilot was unable to get it to the engine. The pilot contacted the Hawaiian National Coast Guard and told them that he had only three hours of fuel remaining, not enough to make it to land. He said he would ditch the aircraft around 320 miles north east of Maui by deploying the Cirrus Airframe Parachute System (CAPS). The Coast Guard informed him of the cruise ship Veendam which was within his range and asked him to divert towards it. A Coast Guard HC-130 Hercules was deployed from Coast Guard Air Station Barbers Point on Oahu to assist and maintain communications. It must have been from there that the video footage was shot. Once the pilot was near the cruise ship, around 250 miles northeast of Maui, he activated the CAPS and the parachute deployed. The aircraft seemed to be almost floating as it descended until the impact with the water. If you watch the rocking of the aircraft as the pilot climbs out, you can see just how turbulent the sea was. At the time of the rescue, weather conditions were seas of nine to twelve feet and winds of 21-24 knots (40-45 kilometres or 25-28 miles per hour). The aircraft sank very quickly after the pilot came free, possibly dragged under by the parachute. The pilot inflated an emergency life raft and was rescued (“extracted”) about 30 minutes later by the crew of the cruise ship Veendam. He was unharmed. There’s also a video taken within the cockpit at the same time. See the comments below for the link to the pilot’s video of the event taken on his mobile phone. The NTSB reports that the investigation is in progress and the final report will be published on the NTSB website: WPR15LA089. Long-distance flight in a single-engined aircraft over large bodies of water ? Always VFR (Very F…ing Risky) ! Q: What purpose is served by light twin-engined aircraft ? A: If one engine fails the other one will carry you to the scene of the accident . A ferry pilot has considered all the pro’s and con’s and by meticulous planning has reduced the risks to the minimum possible. He or she accepts these risks as an inherent and largely unavoidable part of a professional operation. I once belonged to the “private pilot” category of that definition and my planning left something to be desired. Even though the outcome was in the end successful…….. better leave it at that! Jon, that’s fascinating! I’ve added a reference to the main post. I have not yet seen a new contribution about the footage shown all over the world of the horrible ATR crash in Taipe. Filmed by various motorists from car-mounted camcorders, we see the aircraft narrowly miss the buildings before banking sharply, clipping a taxi with it’s wing tip before crashing in the river below. Of course, it is not really permissible to speculate about the reasons of a crash – although the press seldom feels the need of such niceties. So let me speculate. BUT bear in mind that the accident investigation is still in full progress. I have been captain of ATR42 and Fokker F27. – The aircraft suffered an engine failure shortly after take-off. – The affected propeller did not autofeather. – The resulting drag seriously reduced the aircraft’s performance and forced the crew to try and pull up in order to avoid high-rise buildings in it’s immediate flight path . – Narrowly clearing the obstacles, the aircraft stalled and banked steeply towards the failed engine. – With the starboard engine still running at maximum power and insufficient flight control authority due to the (too) low airspeed, the crew did not stand a chance to recover. Of course, I repeat, this is only conjecture. For the real cause we have to wait for the release of the accident reports. Give me a little bit, on it.